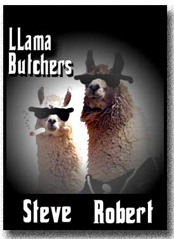 The LLama Butchers: The Horror! The Horror! I've managed to avoid it in over thirteen years of marriage, but last evening I finally got tagged with the mission I've always dreaded: "Since you're going to the store anyway, dear, I need some........."
I've always been a strong believer in the saying that good fences make good neighbors. Furthermore, I believe this observation is equally valid in the realm of marriage. There are plenty of people who feel otherwise, I know, believing that couples should share "everything" with each other. Not me, thank you very much. I'm all for intimacy and trust and being comfortable with each other and all that, but there's also a whole litany of topics that I believe should remain firmly behind the eight foot privacy fence with the "Beware of Dogs and Land Mines" sign hanging on it. And right at the very top of that list is that fearsome and mysterious subject, Feminine Hygiene. Nonetheless, I couldn't very well refuse. Orders are orders, after all. 1.) 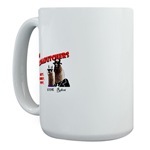 Get the Product last. This will cut down the amount of time you spend wandering around the store with the box in your basket. 2.) Have your camo ready. I specifically bought an unnecessary bunch of parsley to toss on top of the Product once it was in my basket, lest people should see me walking around with the thing. 3.) Good intel wins. I'd been given specific instructions as to brand name, size and the like. But I was damned if I was going to stand around slack-jawed and right out in the open, looking for the thing. Instead, I quickly cruised up and down the aisle several times trying to look sideways in order to locate the Product, the better to grab it quickly and quietly when conditions were right. And the most important part of the plan? 4.) Do not touch the Product if there is anybody else in the aisle. Actually, this last part of the plan proved to be impossible. Safeway is fairly full of homing commuters at 7:00 PM on a Tuesday evening. After waiting a good ten minutes for an opening, I finally gave up on complete privacy and decided just to wait until there was nobody in the particular section of the aisle before I made my grab. Yes, it was risky. But I'd have been there until midnight otherwise. When the moment finally came, I swiftly moved to the location where I thought I'd seen what the Missus wanted. On looking squarely at it, however, I panicked. Wait, did she say this or this? What was the size again? What about fragrance? Did she say anything about fragrance? I don't remember anything about fragrance! Suddenly, I heard the sound I was dreading. Footsteps. Coming in my direction. And the feet were obviously those of a woman. "Buster! Buster!" a voice said in my brain, "Clear the area! Clear the area! Do NOT make eye contact!" Almost blindly, I grabbed impulsively at what seemed to be the correct box, spun on my heal and beat a retreat around the corner into the chips and soda aisle. It took me a minute to catch my breath and to stop sweating. The Product safely buried in the depths of my basket, I made for the exit. However, there was still one hurdle to be cleared: the Check-Out Lady. I had thought myself fortunate in finding a register with no line. Swiftly, I emptied my basket onto the belt, hoping to be done before anybody else got into line behind me. But did the cashier cooperate with my need for speed? No, of course not. Instead, she started fiddling with a plastic grocery bag with which, for some reason, she was having trouble. In my highly embarassed state, it seemed to take her a solid ten minutes to open the thing. Meanwhile, somebody got in line behind me. "Damn you!" I thought, fighting off a wild urge to hide the Product behind the dish washing detergent, "What are you doing? What ARE you doing? If you can't open that one, get another one! Hurry!" Finally, she got the bag open and began to ring me up. But even then I wasn't out of the woods. As she put the Product in the bag, I'd swear she gave me a look from under her eyebrows, a look that combined archness with sympathy. I wanted to bean her. I also wanted to bean the person standing behind me who, although I never actually looked, of course, I'm sure was also watching, probably with a look of smug amusement on his or her face. It turned out, by the way, that I had grabbed the correct box, so at least that was all right. But I certainly hope it's at least another thirteen years before I'm ever called on to do so again. That's the beauty of self serve checkout lanes. Find them. Use them. You will never have this problem again. And when you are unsure of what was specified - for any purchase - cell phones are a great device... "Honey, which one did you say again?" But you credit for two things. Writing a funny post and doing something you didn't want to do for the sake a marital bliss. What you need to do is have Wife write out a list of things for you to get (women's handwriting is different from guys) Then when you go to the store, hand list to female stocker and ask where it is. You aren't getting out of there without any embarrassment, might as well play up the clueless husband angle. And then reward yourself with a six pack of something nice, to help in your recovery. While I know I'm the voice of dissent here - especially as I am, myself, female - your plan of attack is almost spot on for what I go through when needing to purchase said products. Some things should just be available mail order - delivered to your door in plain brown packaging. Hubs actually has less problem purchasing said than I do. On the other hand, as you're not female, at least checkers don't attempt to engage you in conversation about said products to get your opinions or recommend something different. My friend has this theory he calls "Tampon Logic," which states that no heretosexual male between the ages of twenty and forty-five (meaning you're generally not buying them for your sister or daughter) should get their noses out of joint about purchasing tampons because, ahem, it means they're getting some on a regular basis. I have the same problem when I'm forced to buy women's underwear. If I had any shame it'd probably bother me to purchase feminine hygiene products. Of course some of these products are used by tournament fishermen after they've gaffted a potential prize winning fish to bring it aboard. So you could always use the line "I'm going fishing" to really confuse said checkout person. just say they're for stopping nosebleeds. it works! Well done. At least you weren't subjected to those two dreaded words: "Price check!" 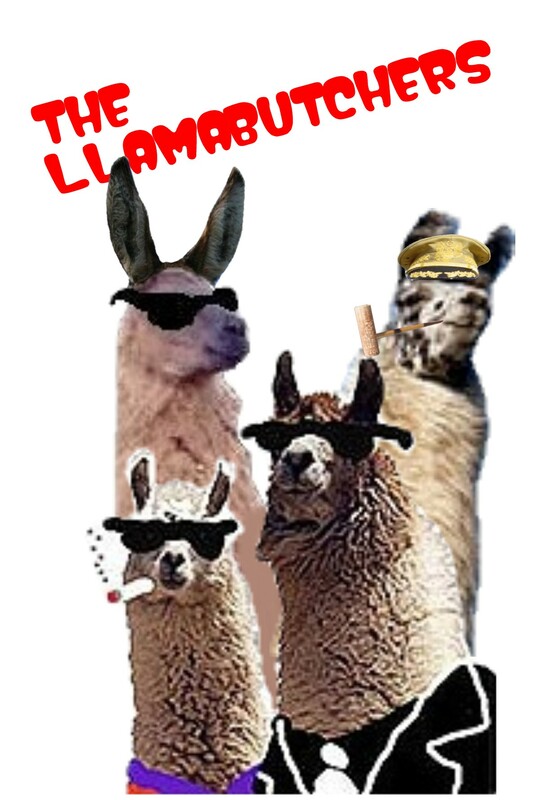 Just be glad you didn't have to take the Llama-ettes with you. I've decided that buying those products, pregnancy tests or anti-pregnancy goods while you have children who can read in tow is really the true test of just how much subterfuge one can manage and/or how much humiliation one can tolerate if discovered. Hmm, does the fact that I don't at all kvetch about having to buy tampons for my wife mean I'm metrosexual? I once had Husband stop and buy a pregnancy test for me. He did and had no problems, but then he was in uniform at the time. Think that made a difference? It would have been hilarious if you'd had a coupon!